It's your day – celebrate it with the perfect album. 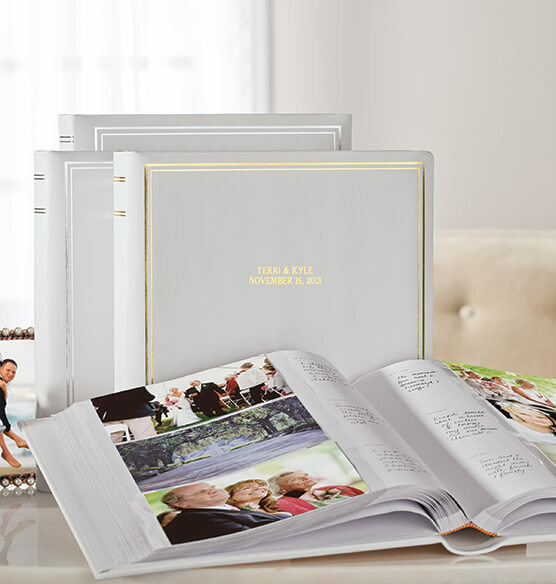 Created from our premier Presidential line with 25 years of expertise, the exquisite Ultimate Wedding Album offers simple, refined elegance. 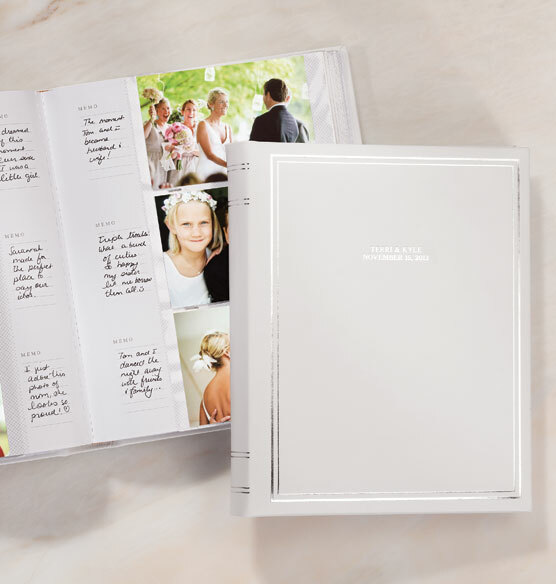 Wrapped in white top-grain leather, this bookbound wedding photo album lets you make notations in ruled columns next to each 4 x 6 photo. Expert tooling on the album's front and spine is available in your choice of gold- or silvertone. Add up to three lines of personalization at no additional cost to commemorate your wedding date, names or a special message of love. Wedding album measures 10 1/4" wide x 13"
I have bought 4 of these albums for my daughters' wedding photos. Holds more than any other leather album I could find. Area for notations is really nice. Embossing well done. Nice way to store wonderful wedding memories! Have ordered in the past and liked products. Also, the item had great reviews. 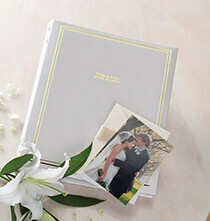 I have ordered many photo albums and scrapbooks from this company over the years. Excellent quality. Because it held so many pictures. I looked at many albums after my first daughter's wedding and this was, for the money, by far the best. It is leather and it is very well made. The printing (I got silver) is well done as well. I like that you can add comments, people's names etc. to the side of the page. I have now bought another two - one for my newly married daughter as well as another one for me. This wedding photo album, already started with "save the date pictures", will make a treasured Christmas gift for our daughter and her future husband, in anticipation of their May 2015 wedding date. Free personalization too! How many photos does this album hold? BEST ANSWER: Thank you for your question. There are 50 pages that each can hold 6 photos per front and back of page. So it can hold up to 300 photos. We hope this information will be of help to you. Can you use 8"x10" photos in the album? BEST ANSWER: Thank you for your question. Unfortunately this album is a memo album and pages cannot be added to it. This album can also only hold 4x6 photos. We hope this information will be of help to you. Is the album available in ivory? BEST ANSWER: Thank you for your question. Unfortunately no, this item only comes in silver and gold.We hope this information will be of help to you. Is it ring binder? Is it archival quality? Does it have an area for comments for each photo? BEST ANSWER: Thank you for your question. The memo album is a not a ring album. It is archival quality. Each photo has its own memo space to write. We hope this information will be of help to you. Does it have tissue paper between pages ? BEST ANSWER: Thank you for your question. No, there is not tissue paper between these pages. We hope this information will be of help to you. How many 4x6 photos does this album hold? Is there a way to add some protective pages for invitations, etc? BEST ANSWER: Thank you for your question. This album's 50 book bound pages hold 3 horizontal 4" x 6" photos per side, 6 photos per page for a total of 300 photos. No, pages can be added to this album. We hope this information will be of help to you.